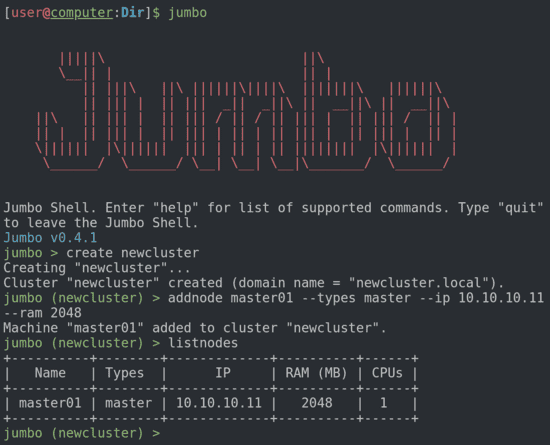 Jumbo is a Hadoop cluster bootstrapper made for developers. It helps you deploy virtualize development environments very quickly. Jumbo is Open Source and comes with a friendly CLI to help you out during your cluster configuration! Jumbo leverages trusted DevOps tools to provision the clusters: Vagrant to manage VMs, Ansible to configure them and Ambari to install the Hadoop services on them. It is also possible to kerberize the cluster with FreeIPA. Jumbo is very easy to use and let you build multi-node kerberized Hadoop development environments. It is an ideal tool to help developers come closer to production to test and progress! Jumbo is an active project and we would love to have your feedback! Don't hesitate to post issues on the project page if needed or to get in touch for any support!